Most of the Environment Court's work involves the Resource Management Act 1991. The court largely deals with appeals about the contents of regional and district plans and appeals arising out of applications for resource consents. The consents applied for may be for land use, a subdivision, a coastal permit, a water permit or a discharge permit or a combination of these.The Environment Court sits in a number of courthouses in different parts of the country. You may appeal the Auckland Council's Unitary Plan decision on the recommendations of the Independent Hearing Panel. How resource consent appeals and plan appeals typically progress through the Environment Court. Read the the Environment Court's practice note, learn about the court's jurisdiction and history, and read biographies of the Environment Judges and Commissioners. In the Environment Court you don’t need a lawyer and you can represent yourself. Forms & the fees you’ll need to pay if you make an application in the Environment Court, including how to pay the fees. Matters before the Environment Court with a high level of public interest or a large number of interested parties, have case information published online. Environment Court decisions & publications. The Resource Management Act 1991 allows you to speak Māori and use New Zealand Sign Language in Environment Court proceedings. Contact the Environment Court registries in Auckland, Wellington and Christchurch. 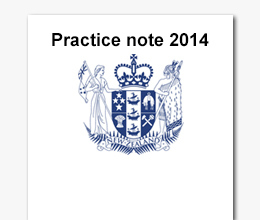 Read our practice note - a guide to the Environment Court. Notices of hearing include the sitting schedule of the Environment Court.